When it comes to decorating your home for Christmas, it's hard to imagine a decked out house that doesn't include a beautiful staircase display. Though green garland or tinsel is a perfectly fine and traditional way to add cheer to your banister, faux greenery isn't the only means of sprucing up your staircase. 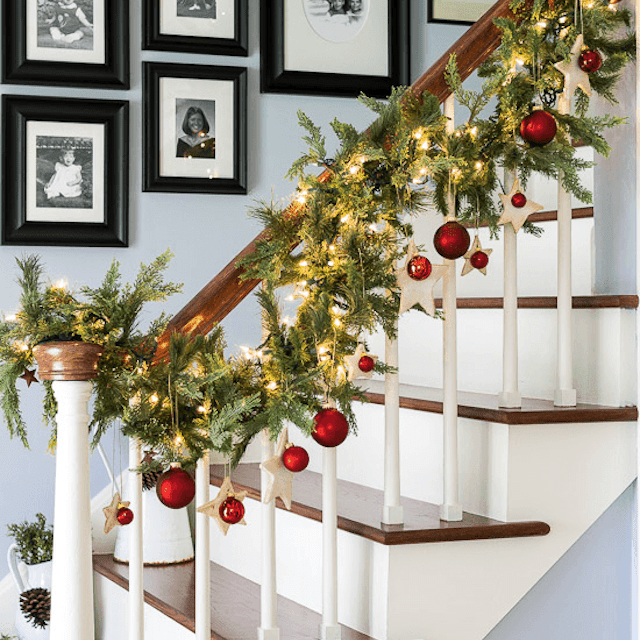 Whether your staircase is the first thing people see when they enter your home or it's tucked away, there are a lot of ways to add some festive flair to your banister. From DIY Christmas card displays to charming farmhouse chic ideas, we've rounded up our favorites this season. If traditional garland is your thing, take it to the next level this year by adding some festive bulbs and lights into the mix. This banister from On Sutton Place is classic and beautiful—and incredibly easy to DIY. Look for a high-end faux evergreen garland and string white lights through it. 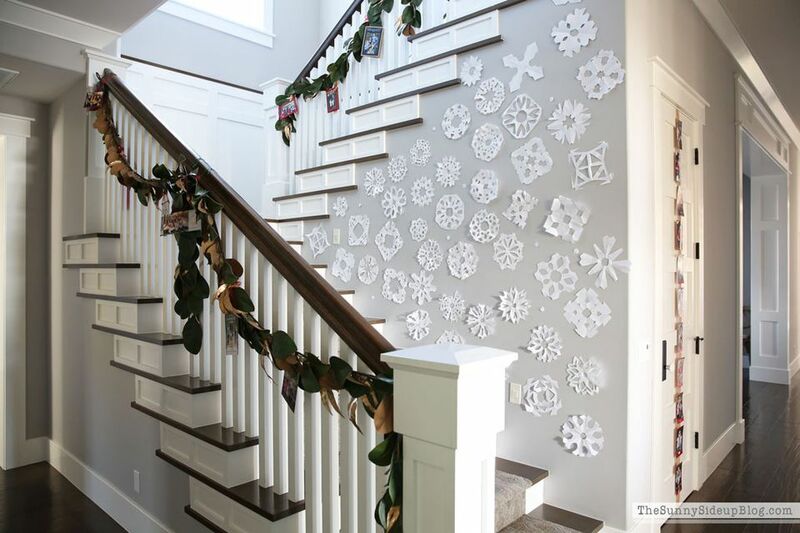 Add a few bulb ornaments (keep the color palette simple to avoid a messy look) or paper snowflakes to finish it off. If you want to keep your Christmas decor farmhouse chic this year, we love these rustic-inspired mason jars from Maison de Pax. With just a little bit of white paint, some mason jars and a sprig of greenery, you can create a warm luminary that's perfect for stairways. Pop in a battery-operated candle for a worry-free glow that doubles as a festive nightlight for those late-night snack runs. Minimalist decor is having a moment, and there are plenty of beautiful ways to adapt this decorating trend for the holidays. This simple entryway spotted on laurastewartblog's Instagram is a cozy and chic way to add some holiday cheer without feeling kitschy. The real evergreen bunches add a wintery, Christmas-friendly vibe that's subtle enough to keep up all the way to New Years'. Ditch the greenery all together this year and opt for something a little more jingle-y. This staircase from Keys to Inspiration channels Santa's ride with a simple red and white ribbon adorned with sleigh bells. If your staircase is close to your front door, you'll get the added bonus of a little jingle every time you come home. Receiving those yearly Christmas cards from your friends and family is what the holiday season is all about, but sometimes there's just no room to display all of them. Blogger The Sunny Sideup came up with a nifty way to decorate a staircase and show off their beloved cards at the same time. This kid-friendly paper DIY is easy to do, incredibly chic and will bring a smile to your face every time you head upstairs to bed. No matter your decor style, it's hard to deny that greenery is the name of the game during the holidays. Get inspired by these stairs from A Thoughtful Place and swap the evergreen garland for wreaths this year. Simple wreaths provide a similar aesthetic to traditional evergreen garlands, but lend a whole lot more visual interest. To further personalize this look, experiment with a felt or boxwood wreath. No fireplace to hang stockings? Use your staircase banister instead! We love this Scandinavian-inspired staircase from Style at Home that not only adds a simple elegance to the space, but provides the perfect hanging spot for stockings, too. Even if you have a traditional mantle for your real stockings, you can stuff a few cheap, matching stockings with tissue paper or shredded kraft paper just for show. Whether you're a child or a child at heart, the advent calendar will always be a fun way to count down to the big day. Here, blogger Happy Home transformed a banister into an interactive advent calendar that's perfect for all ages. This easy DIY can be recreated by hanging small packages numbered one through 25 on the banister with a bit of colorful ribbon and—most importantly—a surprise for each day of December. When it comes to Christmas decor, some would argue that more is always better. Though this oversized garland from The House That Lars Built is not for the faint of heart, it packs a big punch. Made from craft paper, this holly and berry garland is a whimsical and unique way to welcome the holidays into your home. Add in an oversized Christmas tree and a few large gifts, and you have a wonderful, statement-making Christmas theme this year.